Bobby Longenecker and Drew Nesbitt, DPT of HARTZ Physical Therapy in Lititz have teamed up to give you their best tips for dressing for comfort and safety during your winter runs. 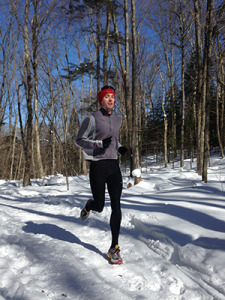 Check out #4 for a great trick for running on snow! Drew Nesbitt and Bobby Longenecker, physical therapists at HARTZ Physical Therapy – pictured here before a winter race. Old Man Winter is right around the corner! We all know what this means: Snow covered roads make it much more difficult to gather the motivation to get out the door for your run. However with the right preparation and appropriate gear, running outside during winter can be a good way to get some fresh air and break the cabin fever of winter. Here are a few tips and tricks to get out and actually enjoy those cold weather runs! 1. Neon Colors are Your Friend: With shorter days, it may be difficult to run during the daylight hours. Just because it is dark outside does not mean you need to stay indoors. A reflective neon vest and a good headlight are essential if you plan to run at twilight or after dark. For added safety, try to select a route that has ample berm or a sidewalk and is not too busy with traffic. A little chilly…at first – You should feel slightly chilled for the first ~10 minutes of your run, then reach a comfortable level. Running Log: Utilize your running log to record clothing choices, weather conditions/temperature and your body comfort level during the run. This is a great way to refine what works best for you! Keeping extremities warm is key; hat, gloves and warm socks are great investments! Base layers should be breathable: Tech clothes allow sweat to be removed from your skin keeping your body at comfortable temp. Zippers are great features on windy days; increasing or reducing ventilation depending on whether you are running with or against the wind. This is a key to maintaining proper body temperature. 0 to 10 degrees: 3 tops, 2 bottoms. Two tops and a jacket. Windbrief and two pairs of tights. Minus 10 to 0 degrees: 3 tops, 2 bottoms, extra pair of mittens/socks, 1 scarf wrapped around mouth or a balaclava. Minus 20 degrees: 3 tops, 3 bottoms, 2 extra pairs of mittens, 1 balaclava, sunglasses. 4. Snow Runs: With the right equipment, snow running can be a blast! Many runners use Yak-Trax, however here is a little trick we have learned over the years. If you have an old pair of running shoes, another option runners have used are sheet metal screws affixed straight into a pair of running shoes. 5. Enjoy the Run: This winter’s successes will have lasting effects on your running. So get out there and enjoy what Old Man Winter has to offer! Drew Nesbitt, DPT started his running career at Hempfield High School where he was a two time PIAA state medalist, then went on to NCAA Division II East Stroudsburg University where he won multiple conference championships, and is currently still competing with the F&M Track Club notably winning the 2015 Hands on House Half Marathon. Bobby Longenecker, DPT started his running career at Lancaster Mennonite HS. Throughout college, he continued running and formed the Penn State marathon club, marathon training class and worked in a running gait analysis lab. Bobby is currently still competing with the F&M Track Club and has had multiple marathon victories.